And when I talk about hypnotizing your audience, please forget the clichés of watch swinging, cluck-like-a-chicken merchants. I’m talking about the hypnosis of life. When you hypnotize someone you get them to “leave the room” as they “travel” along your narrative within their mind. You achieve this by focusing their attention so intently that your words start to have a real effect on their experience – both conscious and unconscious. A skilled hypnotist can help you change the workings of your immune system or blood flow with their words. Think what effect you could have on an audience you are looking to influence. So why do I talk about “hypnosis” when describing the effect a great presenter has? Hypnosis in therapy is so powerful because it helps people learn new ways of responding to life so that low confidence, phobias or addictions no longer trip them up. When you present powerfully you focus your audience’s attention so narrowly that the nature of their learning becomes hypnotic rather than merely conscious. This kind of learning feels a lot more profound for people. But there are different kinds of audience trances.. If you are uninspiring then your audience may certainly psychologically “leave the room” not by following your ideas but as an attempt to escape your talk. They might start to imagine what they’ll do later, what they’ll cook for dinner, or their upcoming social arrangements. They are disassociated but not in the way we want them to be. There are specific techniques to compel your audiences in just the right way. 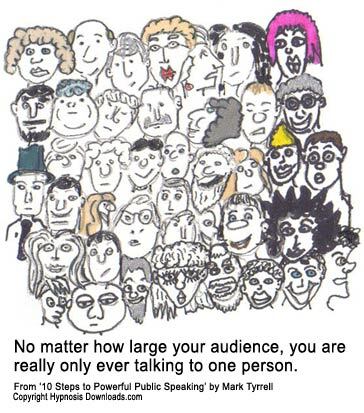 The greatest public presenters will captivate audiences with their words and gestures. They’ll use expectation, language, story-telling and “future pacing” which means they’ll implant ideas for their listeners to act upon in future. This is all hypnotic. Hypnotic speakers don’t just give the facts they will give their listeners an experience that will change the way they feel, think or behave. Hypnotic presenting appeals to the part of the mind that the greatest pieces of poetry or music do. In fact truly world beating public talks have a real rhythm. He uses repetition, emotive words, he paints a picture of a positive future beyond current hard times but he doesn’t lie to his listeners by pretending things are going to be easy. He connects what is important to his listeners, he evokes strong images. And like the language of storytelling or even epic myth he talks about avoiding an oncoming “Dark age” by fierce, proud, brave and collective struggle. In some of Churchill’s speeches his language is almost confusing which is a favourite hypnotic technique too as it”ties up the conscious mind” and appeals more directly to the unconscious which absorbs it often before the conscious mind has untangled it : “Never was so much owed by so many to so few.” He says when talking about the heavily outnumbered RAF men who fought the famous Battle of Britain. We know what he means without following the logical thread of the statement. Words that people have to “go inwards” to connect their personal meaning with are called nominalisations and they are hypnotic. These are words like: “Powerful, beautiful, love, wisdom, strength”…and so on. Make sure these kinds of words fit with what you are saying but they will produce more of a response than more “concrete” type words. Paint pictures in your listeners’ minds by overlapping their senses. Tell stories. Even if you are delivering a speech about molecular biology there are stories to be told – tell them engrossingly. Use your voice to fascinate. Sometimes speed up and sometimes slow…down… a bit. Not all the time or else you will annoy but think about the importance and relevance of your words. When it’s a point you feel is important, slow down a bit and occasionally you can even talk the calm, slow delivery of a real hypnotist. Use unexpectedness. We go into hypnotic trance when we relax but also when we are startled, surprised or even shocked. Great speakers use humor because it can be hypnotic. Humor surprises you – a punch line has a “punch” because it causes surprise. Hypnotists (especially of the stage show variety) will often use “shock “to fast track subjects into hypnotic trance, so be a little surprising here and there to keep your audience focused, then refocused. This technique when presenting is startlingly powerful. Study the effect communication has on people. Just the bits of sound we call “words.” It can make them angry, weep, be prepared to go into battle and change their life infinitely for the better. Words don’t have to be “just words.” Hypnotise your audience to help them feel something real when you speak. This entry was posted in Trainings and tagged 5 steps, hypnosis, Learning.